My relationship with Facebook ads had its first sparkle two years ago. 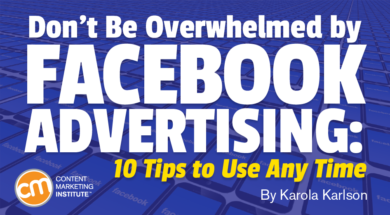 Since then, I’ve overseen 80-plus Facebook ad campaigns that reached more than 2 million people across 30-plus countries. How do I keep up with all the updates and news? Here’s the secret: I don’t, aside from keeping an eye on a couple of blogs about the topic. That’s because most Facebook advertising hacks never get old. You learn them once and keep applying the same best practices across all your Facebook ad campaigns. Start with these 10 key evergreen tactics. Surely, you’ve seen ads in your Facebook newsfeed. I bet you’ve ignored a good share of those ads while clicking only a few. You know what was wrong with those ads that failed to catch your attention? The ads weren’t necessarily bad, they were simply not reaching the right audience. When it comes to Facebook advertising, it is crucial to know your customers well enough to create a highly targeted Facebook ad audience. You must have a good audience match for people to engage with your campaign. For example, if you promoted chocolate bars to people on a diet, your campaign ROI wouldn’t be as high. 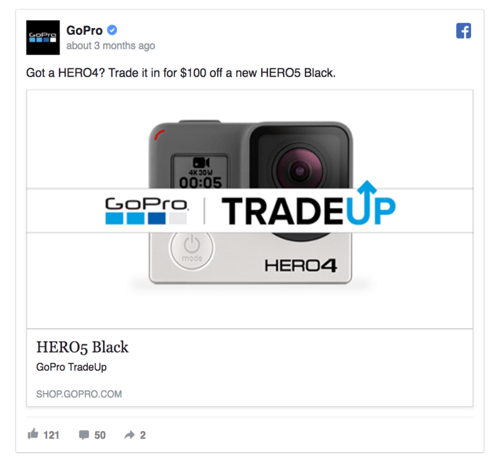 Here’s a Facebook ad from GoPro – it only makes sense for people who own an older model of a GoPro camera, not potential users. Create slightly different ads and messaging for each customer persona. Target ads based on where your target is in the conversion funnel — advertise different messages to the people who never heard of your product, to people slightly familiar with your product, and to your loyal customers. Targeting people based on their interests is a foolproof way to create a Facebook audience. However, the real gold mine of Facebook marketing opens when you use the advanced audience features: custom audiences and lookalike audiences. In one case, we showed the ad below to a wide set of people by using Facebook saved audiences – targets are based on demographics and interest. And guess what? It didn’t work. At all. The cold audiences were not particularly interested in committing to a new project management tool. We switched and targeted people who had been to our landing page by installing a Facebook pixel on our website and targeting them through the custom audience feature in Facebook advertising. Your Facebook ad should always include two messages: a call to action and a good reason for taking that action. Usually, advertisers get it right when it comes to including the call to action. 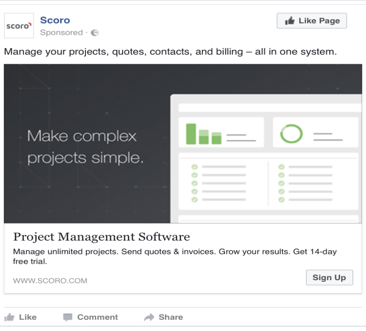 What many Facebook ads are missing is a unique value proposition – a clear one-liner that explains how your product or service will benefit the viewer. 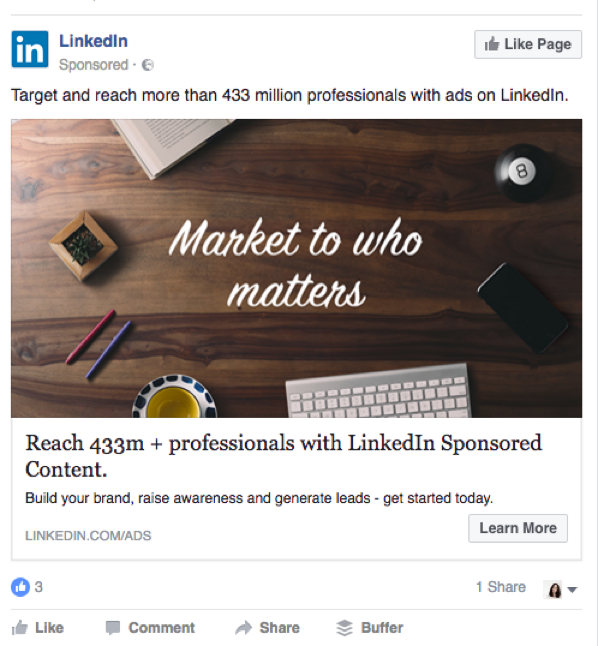 For example, this Facebook ad has a powerful value proposition: Reach more than 433 million professionals through LinkedIn. Alternatively, you can offer a free product trial or a limited-time discount code. 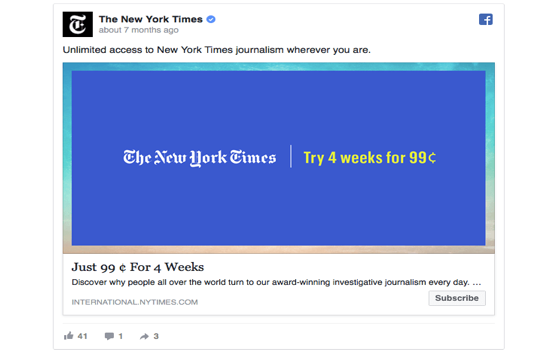 The New York Times, for instance, offers a discounted subscription. The small investment by the readers makes them value the deal more than they would with a free offer. TIP: Don’t brag about your product’s features that seem amazing to you but are irrelevant to your target audience. A simple litmus test for evaluating your value offers is to put yourself in your customers’ shoes and ask: “Would I click on this ad and buy that product?” If the answer is no, spend some more time perfecting the value proposition. Facebook users see tens if not hundreds of images in their newsfeeds daily. If your Facebook ads resemble other pictures in their newsfeed, you’ll get a lot less attention. To make your ads stand out from the crowd, design original ads instead of using stock images. In fact, make your ads boldly stand out so people can’t help but notice. One of the easiest ways is to use bright colors. Alternatively, you could also swim against the flow and create minimalist ads with a white background – a Facebook advertising hack I’ve seen working many times. Your Facebook ad designs do not have to be complex, and you don’t need extensive Adobe Photoshop skills to succeed. What you need is something that looks high quality and catches attention — a design you could easily create by using online tools like Canva. You can’t publish the same ads over and over and get more people to act on them. To catch more target audience members, you need to create different ad creatives. Change at least some of your ad creatives every two weeks. Add new designs to existing ad campaigns while pausing low-performing variations. Create ads in different colors with and without in-image text. Expand your ad images to create more diversity. Set up a Facebook ad rotation schedule by creating two to three ad sets, each with different creatives. Do not change any other elements such as the target audience. 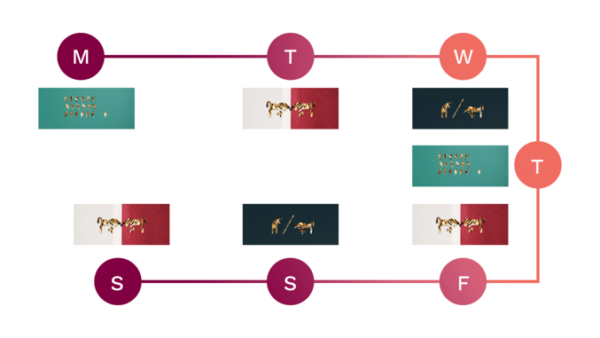 Here is a simplified version of a custom ad schedule: On each weekday, your target audience will see a different ad, and, consequently, won’t get tired of seeing them as quickly. One of the Facebook advertising mistakes I made early in my career was running A/B tests with too many variables and not enough data to get statistically significant results. Another mistake is to create a Facebook ad split test with many variables, e.g., target audiences, ad creatives, and ad copies within a single experiment. Here’s why this approach won’t work: You won’t be able to know which variable affected the outcome. Instead, test each differentiating element one at a time. For example, experiment with the ad creative first. Once you’ve discovered a winning creative, test the copy on the ad. With this sequencing process, you can be more efficient and get statistically valid split-testing results. All the successful Facebook ad campaigns I’ve seen have one thing in common: They are focused on highly specific goals. And I’m not speaking about ad impressions, reach, or website traffic. What are those meaningful results? That depends on your goals. For example, if the goal of your ad is to increase revenue, look at sales numbers. If the ad is to promote your blog, look at the blog’s traffic such as average time on page, number of return visitors, newsletter subscribers, purchase, and more. 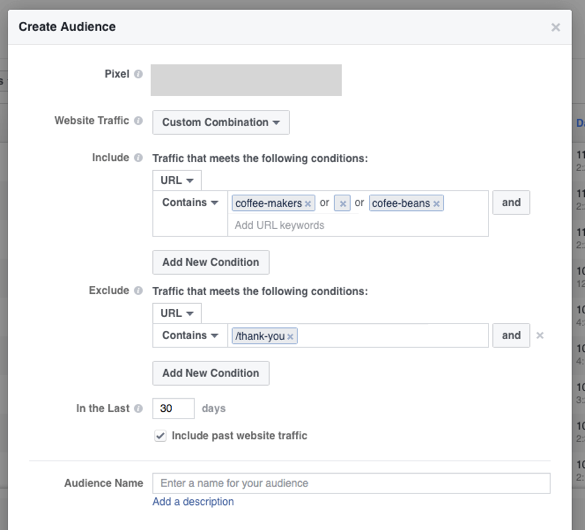 Some of these metrics can be found in the Facebook Ads Manager (if you use Facebook pixels). Other statistics can be found in Google Analytics reports (if you properly use UTM tags for additional campaign insights). Another important thing I’ve learned is that the type of your campaign matters. And it matters a lot. It’s possible to select from an impressive range of Facebook campaign goals from website traffic to app installs to purchases when setting up new ads. How do you pick one for your campaign, especially if multiple options seem like good choices? Think about the goal of your ad campaign. It’s as simple as that. Let the algorithms know by selecting the campaign objective closest to your goal. Do you seek website clicks or do you want conversions such as a free trial sign-up or e-store purchase? The secret is to keep asking why until you get to the core reason you’re running the campaign. I’ve been surprised to learn that less is more with a Facebook ad strategy and implementation. Applying too many hacks might hamper your campaign results instead of helping them. I’m not saying that Facebook advertising hacks do not work. All I’m saying is that if you’ve got a powerful value proposition and the right target audience, things will start to click regardless of the small adjustments you did or did not make. Facebook auto-optimization algorithms can learn to whom to deliver your ads based on previous conversions. If you think about it, Facebook probably knows more about your potential customers than you do. In a recent experiment, my client promoted two identical ad sets – only one targeted an audience 20 times wider. The ad set with narrow targeting had a cost per acquisition (CPA) of $2.67 while the ad set with wider targeting delivered a CPA of $2.79. That’s a minor difference. Test it: Create two identical ad sets. Target one set to an audience of 5,000 to 10,000 people you think would be most interested in your offer. Simultaneously, create a set targeting 80,000 people. Let both campaigns collect at least 100 conversions and run for at least 72 hours. Compare the results. In most cases, Facebook’s algorithms have done an equally good job at delivering your ads to people most likely to convert. Even the cost per acquisition should be similar for both ad sets. By targeting larger audiences, you rule out the chance of missing groups you didn’t realize are interested in your offer. TIP: Still create retargeting campaigns – there’s no Facebook audience more valuable than a retargeted one. I learned the value of this last technique recently when managing 50-plus ad campaigns and struggling to keep up to date with their day-to-day performance. However, it is equally helpful when working on small Facebook ad campaigns. Have your campaign, ad set, or ad turned off. Have your ad set’s budget automatically updated. Automated rules are incredibly helpful in avoiding unpleasant surprises a week or two later when you have the time to manually review the ads’ performance. For example, ask Facebook to automatically decrease the budget for a low-performing ad set while increasing the daily spending of a successful ad set. With that automated trigger, your ad spend will be more effective. 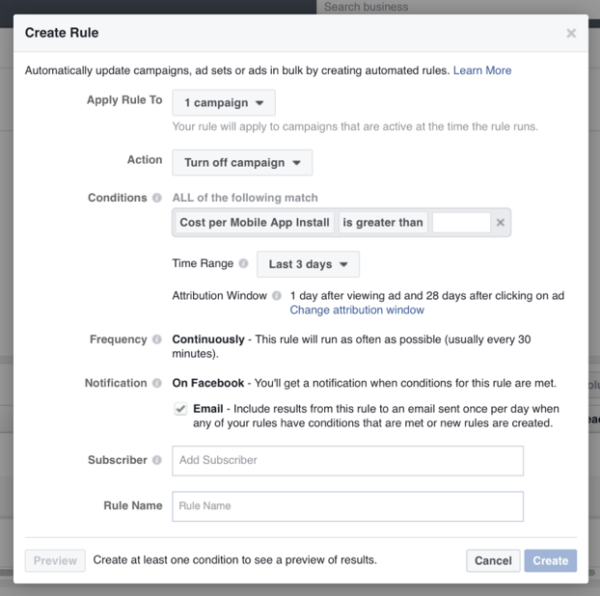 To apply automated rules, go to the editing panel or a campaign, ad set, or ad in the Ads Manager. Next, click on “Create Rule” button. TIP: Ask for an email notification to inform of an underperforming campaign or ad set so you can check out the potential problem and adjust the ads accordingly. 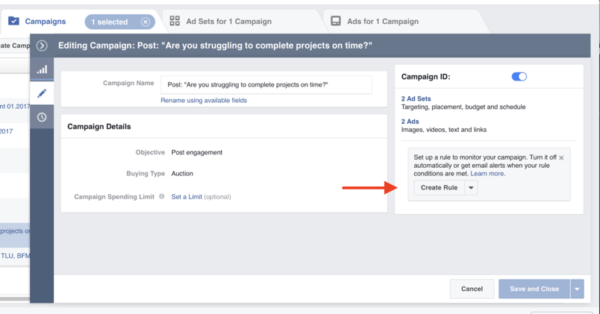 While managing Facebook ad campaigns can seem like a lot of work, with all the automated tools and algorithms working in your favor it’s not as difficult as you may think. The key to successful ad campaigns lies in knowing your target audience and creating high-value offers that improve people’s lives – a skill every marketer can acquire through practice. Stay on top of what’s new and what’s new that you don’t need to care about in content marketing with CMI’s daily newsletter (or weekly digest). Subscribe today.